I received an M.A. in Korean language and literature from Yonsei University, specializing in Korean education. 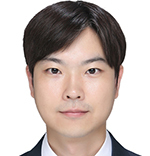 I am currently a Ph.D candidate at YonseiI studied phonetics related to Korean pronunciation and I am interested in dictionary vocabulary and grammar categories. “A Study on the Hierarchy of Korean Pronunciation Rules for Foreign Learners”, The Journal of Humanities and Social science, vol. 8-4, 2017. “A Study on the Meaning of Korean Culture by Analyzing the Words for Cultural Relations”, Korean Language and Culture Education Society, 2017. “A Study on the Grammar and Expression of <the Korean Language Dictionary>", Korea Grammar Education Circle, 2018. A Project on Construction of Korean Learner Corpus, National Institute of the Korean Language Project, 2017~2018.